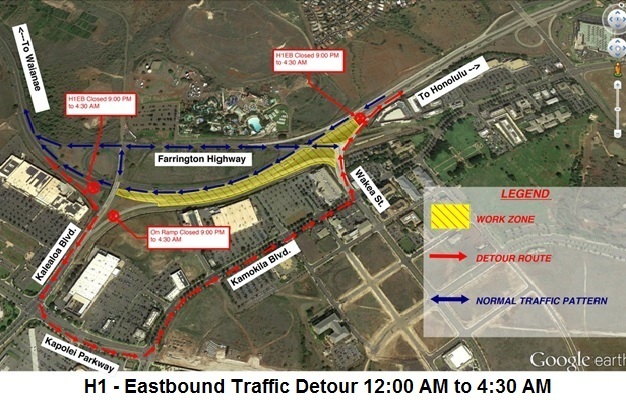 HONOLULU – The Hawaii Department of Transportation (HDOT) advises Oahu motorists of nighttime closures on the H-1 Freeway between the Makakilo Drive Overpass and the Kalaeloa Boulevard Overpass, for the Kapolei Interchange Complex, Phase 2 project. The following two nights of closures will complete the installation of the temporary working platform. See details below. Eastbound closure, Tuesday, March 28. 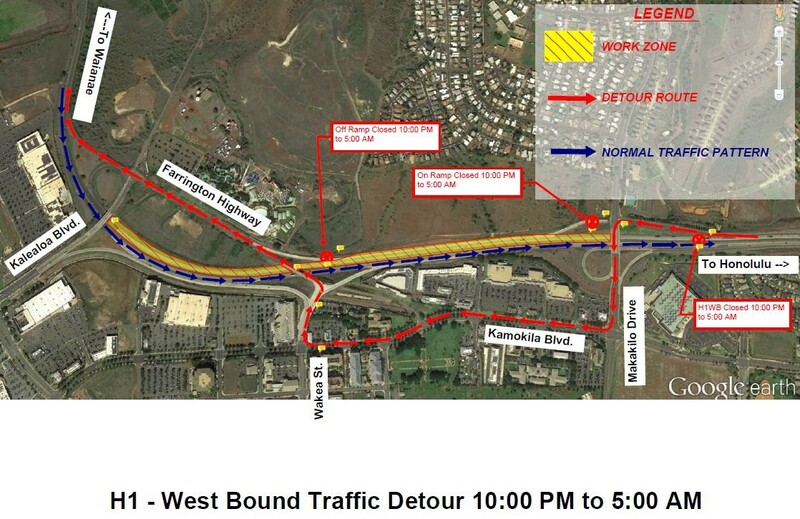 Closure of the H-1 Freeway in the eastbound direction between the Kalaeloa Boulevard Overpass and the Makakilo Drive Overpass on Tuesday morning, March 28, from 12 a.m. to 4:30 a.m. Westbound closure, Sunday, April 2. Closure of the H-1 Freeway in the westbound direction between the Makakilo Drive Overpass and the Kalaeloa Boulevard Overpass on Sunday night, April 2, through Monday morning, April 3, from 10 p.m. to 5 a.m.
A full closure of the H-1 Freeway is necessary to install a temporary working platform to ensure public safety while work is being done along the edge of the Farrington Highway Overpass bridge for the retrofit. HDOT advises motorists to prepare for the closure by checking traffic apps, mapping the best route, and adding extra travel time to their commutes. Electronic message boards will be posted to warn motorists of the closure. Special Duty Police Officers will be on-site to assist with traffic control. Emergency vehicles, first responders and TheBus have been notified of the roadwork and will not be allowed through the work zone due to lifts that will be placed on the freeway for the retrofit installation. Roadwork is weather permitting.